Kingston Beach is a suburb of the greater Hobart area, capital of Tasmania, Australia. It is located on the Derwent River at the mouth of Browns Rivulet. 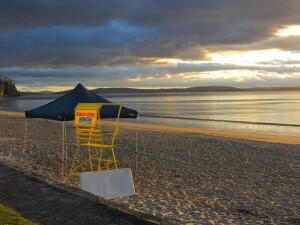 Located 15 km south of the city, Kingston is the first main swimming beach southwest of Hobart. The area surrounding the beach is highly developed with Kingston Beach shopping area and housing behind the beach, and residential development on the southern slopes overlooking the beach. Kingston Beach commences at the river mouth and curves to the south for 1 km to the first rocks of Boronia Point. The beach faces east-southeast receiving waves travelling up the Derwent estuary and averaging about 0.5 m, which break across a 30-50 m wide low tide terrace. A seawall, narrow reserve, picnic area and playground back the beach and towards the south there is a boat ramp across the beach and the Kingston Beach Sailing Club in the southern corner. The beach is backed by Osborne Esplanade, then four rows of houses, which completely occupy the low 250 m wide barrier system, with the river behind. Kingston beach has public toilets located in the middle of the beach across the road and also showers next to the playground at the Southern end. Drinking water is also available from several taps along the beach pathway. 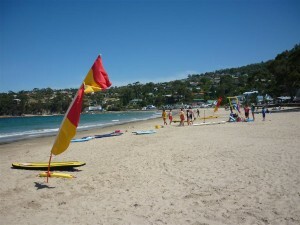 Kingston Beach is a relatively safe beach with usually low wave to calm conditions. Beach goers should stay clear of boating activity in the southern corner and always watch for deep water off the beach.